Wagner, who worked for the real-life “Mr. 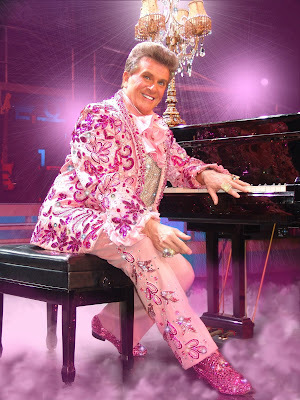 Showmanship” in Las Vegas as a pianist and singer, has played him for more than 20 years across the world in the renowned “Legends In Concert” show, as well as many productions that he arranged and produced himself. With a script by Brent Hazelton, Liberace! is a satisfying medley of impersonation, piano playing and biography -- a combination Director Jacqueline Hubbard said was difficult to cast until she saw Wagner. Against a setting of three arched curtained areas surrounded by standing and hanging candelabra (set design by Daniel Nischan), Wagner sits at a grand piano center stage to play musical numbers as diverse as a Rachmaninov concerto to "I'll Be Seeing You," "Three Little Fishies," and "The Boogie Woogie."